(M) Mens Vintage 1980's Sweater! Dark Teal, Magenta, Blue, Leather Diamonds! 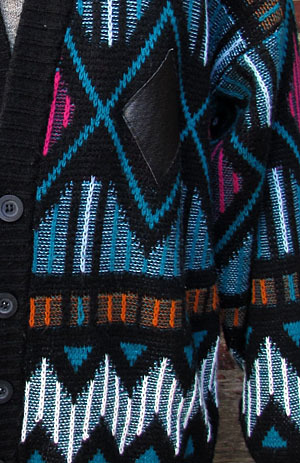 Home > Men's Vintage Shirts > Sweaters and Cardigans > (M) Mens Vintage 1980's Sweater! Dark Teal, Magenta, Blue, Leather Diamonds! 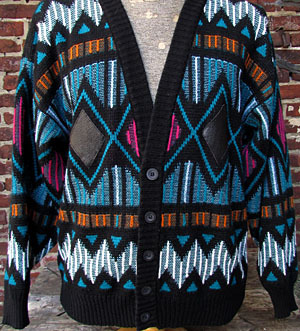 Mens Vintage 1980's Sweater Cardigan! Cool shades of Dark Teal, Orange, White, Pale Blue, Magenta and Black in a groovy pattern of diamonds, triangles, lines and squiggles, with two genuine leather diamonds on the front at either side! Totally rad colors, very unique! Five black buttons down the front with a deep-V collar. Straight hem with ribbed edges. Tagged by Exchange Unlimited. 100% Acrylic with Genuine Leather.